← Steel Rails double-slit build for IQC == win! Dave White and I were rolling through the streets last night after CinqASept and I decided to try a new camera mount I rigged up to get some night shots. Shot through the windshield, camera is taking frames every 5 seconds (raw + jpeg). No optimization of the camera setup at all: we were just going to get a $1 Diet Coke at McDonald’s. I liked the serendipity of the output. The rare clear shot that is less interesting. This calls for longer exposures. This entry was posted in photography and tagged night. Bookmark the permalink. 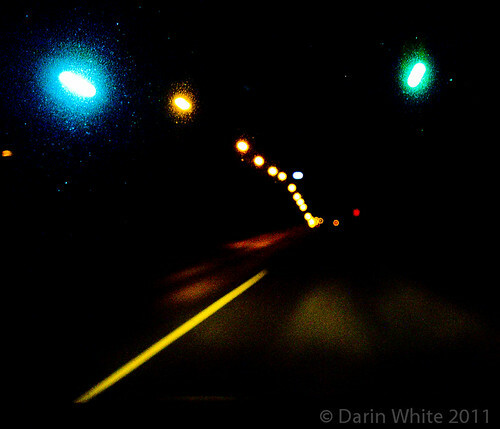 Darin… your night drive photos are very interesting and beautiful. 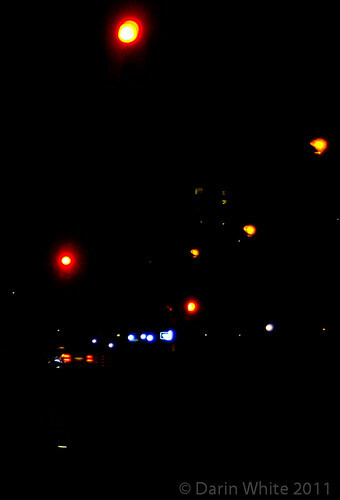 They remind me of my waterfront marine late night shots many years ago. You are a better at this than I was! However, I compliment you on your ability to compose the subjects and the use of your new Nikon gear… keep up the good work, young man!